The Siamese famously (and unjustly) appeared as villains in Disney's Lady and the Tramp. This breed is something of a benchmark for how active, curious, and vocal a cat can be. Don't bring a Siamese home just because you like their look—there are lots of lovely cats out there! This breed requires an engaged family to keep her busy brains and paws occupied every day. These cats weigh an average of 6-10 pounds and can live more than 15 years. WHAT IS THE SIAMESE'S PERSONALITY LIKE? Siamese are, if you'll forgive the phrase, doggedly devoted to and decidedly dependent on their chosen people. If you're looking for a cat to be up in every single facet of your business every day of the week and twice on Sundays, the Siamese is for you. While they may appear aloof at times, these sidekick kitties require patience, respect, and lots and lots of affection. WHAT IS SIAMESE BEHAVIOR LIKE? Your Siamese is going to share every single thought that comes into her head whenever she can for as long as you'll listen (and then some). And if she can't talk to you, she'll talk to herself. But your Siamese will be much happier with you around——remember, this cat lives for your attention. And honestly, it behooves you to keep an eye on her; this smarty-paws is apt to go looking for trouble if she's feeling understimulated. HOW CAN I KEEP MY SIAMESE ENTERTAINED? Don't worry, she'll let you know. Siamese will entertain themselves by playing with your faucets, opening your cabinets, finding new hiding spots, and watching the television with you. But you might try a leashed walk or playing a game of fetch to give her some more appropriate outlets each day. She'll also happily watch the Bird Channel out your window and might be willing to let you clicker-train her to do tricks. This kitty might also run feline agility courses. WHAT DO SIAMESES LOOK LIKE AND WHAT ARE THEIR GROOMING NEEDS? You probably already know what Siamese look like—they might be the most recognizable cat on Earth. This breed comes in four colors (according to the Cat Fanciers Association, though more colors are possible) and have vivid blue eyes. Your cat's coat and skin can tell you a lot about her health and wellbeing. Healthy cats have coats that are smooth and shiny; they should have supple, clear skin. Nutrition and wellness factor heavily into the texture and luster of your kitty's coat, but you can help keep her looking and feeling her best with regular skin care and grooming. Most healthy, grownup cats won't need regular baths in addition to their own grooming routines—though if your cat is older, you might want to do some research on helping her keep up appearances. WHAT HEALTH PROBLEMS DO SIAMESES HAVE? Though generally healthy, some Siamese can be prone to dental or respiratory problems, as well as eye ailments, heart disease, bladder stones, and cancer. ARE SIAMESE GOOD FOR PEOPLE WITH ALLERGIES? 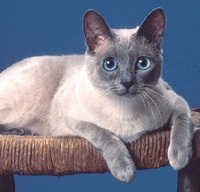 Siameses aren't among the breeds generally recommended for allergy sufferers. Remember that no breed is 100% hypoallergenic, and any breed can aggravate allergies. You can reduce your furry friend's impact on your allergies with daily brushings. This will reduce pet dander and loose hair floating through the air you breathe and landing on your clothes and furniture. Bonus: think of the money you'll save on lint rollers. If your pet allergies are mild, a regular grooming session could have a big impact on your quality of life with your pet. WHAT IS MY SIAMESE'S BEST DAY? These sensitive super-smarties crave interaction with you, so play games with her or take her for a leashed walk. She may delight in chatting back and forth with you all day long (and we do mean allllllll day). SHOULD I ADOPT A SIAMESE? Siamese aren't for folks who are looking for just another pet. If you commit to this cat, she's nothing less than your feline life mate. Have you decided that a Siamese is the purr-fect cat for you? Why not be your new best friend's hero and adopt a rescue! Be sure to check out our article on what to expect when you're adopting a dog or cat.